A quick delicious beef recipe for those who are always in a hurry. 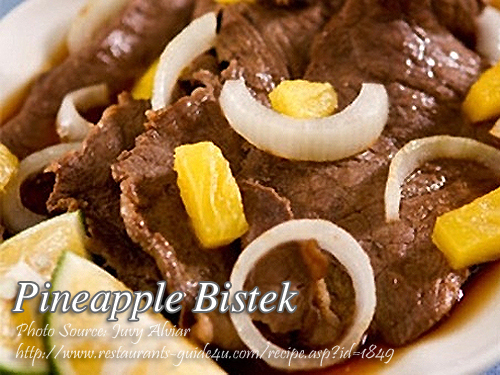 This bistek recipe is tropical inspired with the addition of pineapple tidbits. This dish is as simple as the usual bistek dish with just an extra ingredient which is the pineapple syrup and pineapple tidbits. It is also important to choose the right cut of beef which is the sirloin so it will be easier to cook. To cook Pineapple Bistek; Marinate beef for 1 hour. Drain and reserve marinade. Fry beef in 1/4 cup oil until light brown. Retain 2 Tbsp. oil in pan. In the same pan, saute onion until almost tender. Add soy sauce, 1/8 teaspoon pepper, calamansi juice and marinade. Simmer for 2 minutes. Add fried beef and Del Monte fresh cut pineapple tidbits. Simmer again for a few minutes and serve. To see the complete recipe and list of ingredients, continue reading.